Condé Nast Traveler’s first ever Visionaries issue features celebrities, activists, companies and more who are changing (and challenging) the world. 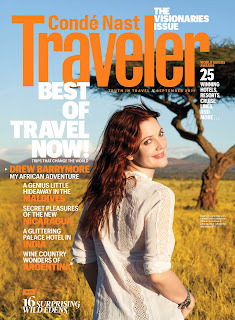 Drew Barrymore graces the cover for the inspiring work she has done and continues to do in Kenya. Through the World Food Programme, she has built a brand-new primary school, provided food for children, and dug wells that are life altering for the villagers. “I want to explore and become more socially aware,” says actress, World Food Programme Ambassador, and September cover star Drew Barrymore. She travels with writer Susan Hack to rural communities in Kenya where, she, through the World Food Programme, has given a brand new primary school, food for children, and wells that are “life-altering” for the villagers. “Fetching water was our burden as women, even when we were heavily pregnant,” Mungelina Lekakaile, a 54-year-old grandmother tells Barrymore. “I am so happy because now we don’t have to think about water. We and our children can focus on other things.” “Travelers should look at the harsh realities of a place but balance that with seeking its beauty. It’s important to acknowledge the reality of how the world functions but also to keep a sense of hope,” says Barrymore.